The Nursery program provides children with a strong foundation for learning in a safe and nurturing environment. Gross and fine motor skills are also being developed and strengthened through the use of manipulatives, Play-Doh, and a physical education program. The children will learn socialization skills while working on academics. Our curriculum incorporates colors, shapes, numbers and letters through the use of manipulatives, centers, STEM activities as well as through play. This program also offers Spanish, religion, and technology on a daily basis, which reinforces and reviews the concepts taught inside the classroom. Finger plays and music & movement play a major role in this age group. 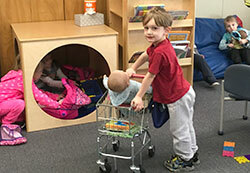 The Nursery programs are available for three-year-olds. We have a two-day program, Tuesday and Thursday—a morning session from 8:30 am – 11:00 am and an afternoon session from 12:30 pm – 3:00 pm. These programs are designed for children who are three by September 1.